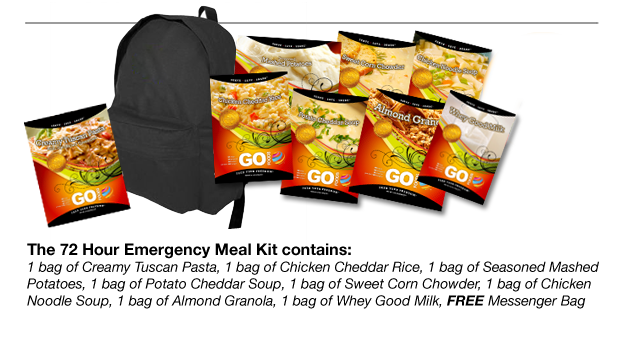 The 72 hour Emergency Meal Kit contains pre-made meals that are ready to add water and cook. Each Mylar bag has 4 servings in it: Each Kit includes:1 bag of Creamy Tuscan Pasta, 1 bag of Chicken Cheddar Rice, 1 bag seasoned mashed potatoes, 1 bag potato cheddar soup, 1 bag of Sweet Corn chowder, 1 bag of Chicken Noodle Soup, 1 bag of Almond Granola, 1 bag Whey Good Milk, and a Backpack to keep the food in so you can grab it and go when you bug out. This pack will feed 2-3 people for 72 hours.